If you study ‘earthshine,’ the light of our planet reflected off the unlit part of the Moon, you can discover much about how life leaves an imprint upon a spectrum. It’s a useful exercise because one of these days we’ll have the tools in place to be examining the spectrum of a terrestrial world around another star. In Earth’s case, what two different teams have found is that water vapor, oxygen and ozone can be traced, just the kind of biosignatures we’d hope to find on a terrestrial world elsewhere. …Earth-observing satellites like Landsat use [the red edge] to map changes of the forest cover in the Amazon, for example, by taking images in two bands that fall on either side of the red edge. In the hemisphere-averaged spectrum of Earthshine, the red-edge signature is diluted by those vast areas on the planet either devoid of vegetation (e.g. oceans, deserts) or hidden beneath clouds, making it tougher to detect. Giovanna Tinetti of University College London has estimated that at least 20 percent of a planet’s surface must be covered by plants and free from clouds for the vegetation’s imprint to show up in the global spectrum. None of this is easy, of course, because earthshine gets mixed up with the spectra of both the Moon and the Sun, but careful subtraction of light from the lunar crescent makes it possible to isolate the Earth’s spectrum. The earthshine spectrum rises toward the blue, Jayawardhana notes, because molecules in the Earth’s atmosphere scatter blue light more efficiently than red light. We know how significant photosynthesis is for sustaining life on Earth, and it’s not unreasonable to think that some kind of light-processing pigments like chlorophyll would be present on other planets. We can add, then, the spectral signature of such pigments to the other biosignatures of note, because the more such signatures we find on a given world, the greater the chances we’re looking at life and not some other process at work. It’s interesting to ponder what color pigments would dominate on worlds circling different kinds of stars than our Sun. I see the question is being discussed at the Royal Astronomical Society’s National Astronomy Meeting in Llandudno, Wales through the work of Jack O’Malley-James (University of St. Andrews). O’Malley-James is asking how the light of multiple star systems would affect the life evolving on the planets around them, and specifically, what plants might be like on an Earth-like planet with more than a single sun in the sky. The combinations would be endless, given the apparent multitudes of planets in our galaxy and the fact that 50 percent of red dwarfs, and 25 percent of G-class stars, are thought to occur in multiple systems. We then have to factor in the configuration of planetary orbits, which might circle two closely spaced stars or orbit one of two more widely separated stars. If life really is widespread, then foliage on such worlds should come in a profusion of different colors. 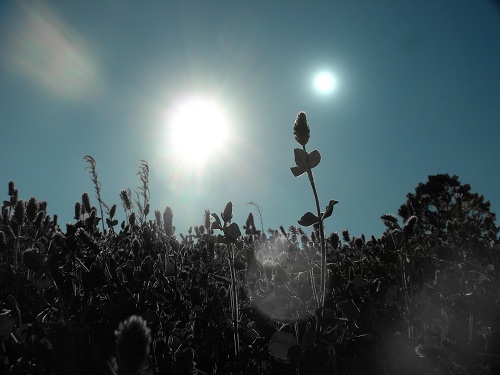 Image: Black plants on a world with two suns. Credit: Jack O’Malley James/University of St. Andrews. Nancy Kiang (NASA Goddard Institute for Space Studies) has also been studying the spectral signature of photosynthesis, noting how the color of the pigments varies depending on the spectral type of the host star. Planets circling F-class stars, for example, would probably have plant pigments that absorb primarily in the blue, with the result that these plants would appear red or orange to our eyes. Work with the spectrum of an F-class star’s terrestrial planet and you might find a ‘blue edge’ rather than a red one. The red dwarf scenario is as O’Malley-James describes. Most of the photons reaching the surface here are in the near-infrared. Plant pigments would have adapted to use the full range of visible and infrared light, while reflecting little back, hence their black appearance. But Kiang notes the difficulty in getting photosynthetic organisms to evolve in such settings, given the UV flares often produced by young M-dwarfs. The first photosynthetic organisms lived under water, which acted as a solvent for biochemical reactions and provided protection from UV rays in the absence of the ozone layer. These bacteria had to use infrared light, filtered through the ocean, so their pigments had to be different too. Later, as oxygen and ozone levels built up, green algae emerged, first in shallow water and eventually on land. Their plant descendants have adapted to the atmosphere’s changing composition, itself primarily the result of photosynthesis. Chlorophyll is customized for present-day conditions on Earth. Find the right absorption band in the spectrum of a distant exoplanet and you just might be looking, then, at the signature of alien plant life. Work like O’Malley-James’ and Kiang’s can help us understand where in the spectrum to look, taking into account the different kind of stars we’ll be finding planets around, and the multiple systems in which many of them will orbit. The further trick will be to demonstrate that the signatures we do detect do not have other possible explanations, a challenge astrobiology continues to address. For more on the colors of exobiology, see this earlier Centauri Dreams post. If I were to predict the color of earth plants, in the absence of any evidence, I’d say ‘black’: total absorption of energy. Reflection (yielding color) is inefficient. Yet plants are far from black. Logic fail. Chlorophyll appears green because it reflects green light, which is actually at the wavelength of maximum emission in the sun’s blackbody curve (google ‘solar spectrum’). This is rather inefficient. The reason may be that the first photosynthetic bacteria were purple (absorbing green, leaving only red/blue as “debris”) [they still exist; google “purple photosynthetic bacteria”]. Thus, green light was seriously depleted from the spectrum (especially for competitors below a floating purple scum), so the only available color niche was purple (reflecting green). Green photosynthetic bacteria (now frequently chloroplasts) filled it, and seem to have been trapped in the green niche. Blah blah blah… my point: attempting to predict the color of extraterrestrial plants (assuming that something akin to photosynthesis even exists!) is an amusing pastime, but certainly not worth taking seriously. This all seems to be highly dependent on light absorbing organisms being in a not too light absorbing medium, like air. Could marine phytoplankton be observed? What about a macro alga, floating beneath the surface. What about land plants, but living under a dense atmosphere that has different light absorption characteristics? It’s always interesting to see techniques being enhanced to improve the armory of tools available for the detection of extra terrestrial life, but I suspect that they are all too often assuming the target is fairly terrestrial in nature, both in terms of its physical characteristics, and its biology. Another question is how would this information be used should we wanted to send a colonizing starship. Should we go to targets that look terrestrial, and be subject to unknown organisms that we would likely biologically interact with, or should we target those planets where life exists, but is biologically so different that we would not interact with it? Maybe my reasoning is naive, but I’ve been wondering whether this state of affairs, which I’ve seen described as “a bizarre coincidence” as well as “highly inefficient” is anything but. Maybe Earthly plants reflect green precisely because this is the wavelength of light that they receive in greatest abundance — just as people who live in latitudes that receive the most direct sunlight tend to have darker skins, and perhaps for similar reasons: Maybe Earthly plants reflect green to keep their inner workings from receiving too much solar radiation and possibly being damaged by it. Their green color is a radiation-regulation system, in other words. If this is true, then I’d expect the plants of other worlds to also reflect the wavelengths they receive the most of. Plants on the world of a red dwarf star, for example, would tend to be dark red to reddish-brown to black — reflecting light in the red-to-infrared spectrum. Plants on the world of a late F star, on the other hand, would be tend to be more blue than Earth plants, or possibly violet. Plants on the world of a K start might tend to be orange or yellow. On the other hand, djlactin’s scenario about the initial evolution of green-absorbing but purple-reflecting photosynthesizers, followed by the evolution of purple-absorbing but green-reflecting successors, seems pretty convincing. However, my own reasoning above seems so simple and obvious that I’d like to mention it, if only to have someone more knowledgeable than me authoratively dismiss it. Because otherwise it never seems to be considered at all. djlactin is right, a classic analysis, as is the one above, would imply that vegetation on Earth should be black, or at least red. I feel that the part missing is that evolution has directly coupled the light harvesting mechanism to the standard chemical buffer when photosynthesis was still crude. As time goes by the buffer becomes more and more useful and less and less likely to be displaced. Thus life on Earth not only needs enough energy to make the ATP bond but it must be sufficient highly charged that this process could go at pace to near completion. Perhaps a second factor is that normally a reversible reaction is fine in biochemistry, since the product that transformed into a reactant stays around for subsequent use, but here the product would be light that might just laser off into space. If so, the light harvesting complex would need to loose enough energy after photon capture to make this process irreversible. I’m assuming here that the molecular law of microscopic reversibility applies to light as well as chemicals. I’ve never read that it does, yet can’t see how it wouldn’t. If someone knows, and I’m wrong please correct me. I’ve just realised, the above only applies directly to bacteriorhodopsin which is red, and the argument aplies in a far more complex fashion to photosystem I and II from chlorophyll. I feel though that it is still valid. In which case, you might have to explain why plants that receive dim light, e.g. tropical plants in the understory, those in teh high latitudes, and those in te ocean, do not become less green by evolving chlorophylls to absorb more light. In fact a number of algal species do have different chlorophylls (but they are accessory pigments to trap light). But we certainly do not see that in terrestrial plants. It may well be that evolution just cannot create new types of chlorophyll in the time frame needed (photosynthesis and respiration are both highly conserved) and has to work with the most successful early solution. Don’t forget that photosynthesis evolved in the aqueous environment. Light absorption is maximal at the red end of the spectrum and minimal in the blue. Thus water living bacteria would have the most advantage if they trapped blue light as they could then harvest light in deeper water where other nutrients might be richer. Another issue to bear in mind is that while the intensity of sunlight is higher in the green spectrum, the energy is concentrated in the shorter wavelengths, so absorption in the blue spectrum maximizes energy trapping for conversion to sugar. This unfortunately does not explain why the red end of the spectrum is also preferentially captured, other than as a “just so story” of the actual mechanism of light capture by these pigments. Actually, oxygen-generating photosynthesis makes use of TWO photosystems to mediate two essential reactions. One of the photosystems makes use of higher-energy blue light, the other of lower-energy red light (for a detailed explanation see Kiang et al., below). Now, if you have to use the same number of photons at each of two separate wavelengths, the most economical way to get them is if the two wavelengths are on either side of the illumination peak (green, for Earth) with an inevitable trough in the middle (also green). It’s like finding the best way to fit a capital “M” under an inverted “V”. In order to avoid overheating your system, you want to reflect everything that you are not using for synthesis. So, you would reflect everything below the longer of your two useful wavelengths–infrared and deep red, hence the “Red Edge”. At the other end of the spectrum you would also want to reflect UV. And finally, you would want to reflect the unusable stuff between your two “working” wavelengths–i.e. the green light. And that is why Earth plants are green. A similar pattern (if not necessarily the same color) could be expected elsewhere, as long as the photosynthesis process made use of two different wavelengths of light. (PhysOrg.com) — By observing the Moon using ESO’s Very Large Telescope, astronomers have found evidence of life in the universe — on Earth. Finding life on our home planet may sound like a trivial observation, but the novel approach of an international team may lead to future discoveries of life elsewhere in the Universe. The work is described in a paper to appear in the March 1, 2012, issue of the journal Nature.